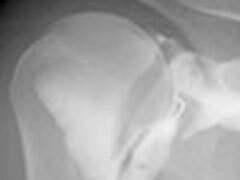 An arthrogram is the examination of a joint using X-ray. The most common areas studied include the shoulder, knee, or hip. During the examination, the radiologist, a physician who specializes in medical diagnosis through X-ray, injects a special dye (contrast medium) into the joint space while watching with the X-ray machine. An X-ray technologist will assist in the exam. What you can expect during the arthrogram? The technologist will bring you to the exam room. The procedure will be explained to you and you will be asked to sign a consent form. You will be positioned on the X-ray exam table, typically on your back. The area around your joint will be washed with antiseptic soap and covered with a sterile drape or towel. The radiologist will use a small needle to numb (anesthetize) the area being examined. A special needle is then inserted into the joint space and the X-ray dye is administered. After the radiologist has confirmed that the contrast is in the proper place, the joint will be exercised gently and several X-rays will be taken. This exam is usually ordered by your physician to confirm ligament damage or cartilage tears. Depending on the study, a CT scan or MRI may follow your arthrogram to provide additional diagnostic information. An arthrogram typically requires 30 minutes. When combined with a CT scan or MRI, the procedure may take up to 90 minutes. Your joint may be tender for up to a day after the exam. Report any increased pain or fever to your doctor promptly. Details document - What is X-ray dye?